Tom Perez and Bernie Sanders teamed up to push the biggest reform package the party has seen in decades. CHICAGO — The Democratic National Committee voted Saturday to significantly curtail the power of superdelegates and make presidential caucuses more accessible, overcoming objections from a vocal minority of its membership. The reform package, pushed by DNC Chairman Tom Perez and allies of Vermont Sen. Bernie Sanders, among others, passed overwhelmingly by voice vote at the DNC’s summer meeting here — two years after the process started. Perez and others hailed the outcome as momentous, saying the reforms will help welcome new people into the party by reassuring them that their vote will never be overruled by the party leaders who can vote for whomever they want for the presidential nomination. The change will prohibit superdelegates from voting for president at the party’s 2020 convention, unless the outcome is already assured or it deadlocks, which hasn’t happened in decades. The vast majority of superdelegates sided with Hillary Clinton over Sanders in their primary fight two years ago. The new rules will also make caucuses more accessible by requiring state parties to accept absentee votes, addressing concerns that the caucuses are less democratic than primaries because they require people to physically attend the events in order to participate in the presidential nominating process in their state. A number of state parties are already considering replacing their caucuses with primaries, with some state party chairs here predicting the 2020 nominating contest will feature many fewer caucuses than in 2016. The DNC can’t force states to change their rules but the reform package includes measures to encourage states to open their primaries and caucuses to independent voters, as well as to expand same-day voter registration in order to bring new voters. Saturday’s vote was the conclusion of a lengthy process that began just before the 2016 Democratic National Convention, coming out of the animosity of that year's presidential primary. The party created the Unity Reform Commission to propose changes, which then led to 83 hours of discussion in the DNC’s Rules and Bylaws Committee, which then led to a vote by the party’s Executive Committee and then, finally, approval by the full DNC in Chicago. 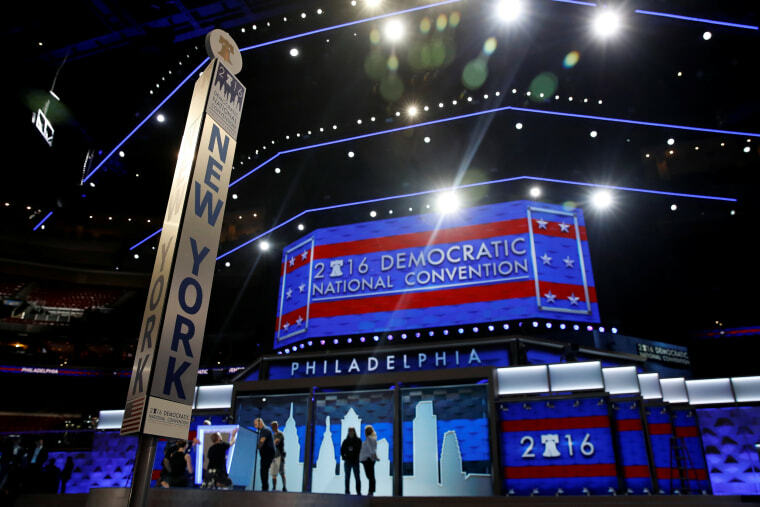 Nearly every DNC member is a superdelegate, so some were not eager to give up their power. Defenders of the status quo headed into the meeting knowing they were outnumbered, but determined to fight. However, after a procedural vote that went overwhelmingly in Perez’ favor, they saw the writing on the wall. In a dramatic moment, Don Fowler, a former DNC chair who has been leading the resistance to the superdelegate change, stood to essentially concede and call for a swift approval of the changes by acclimation, rather than a full vote by paper ballots. That was met with a standing ovation from delegates, many of whom were eyeing the clock as they hoped to catch flights later in the afternoon. The debate was passionate and personal on both sides, provoking a hunger strike, invocations of the Bible and JFK, and some hurt feelings. But in an interview with NBC News, Perez said he'd much rather have passion than apathy. He compared the fight to a healthy "family" discussion, and said he was pleased the party ultimately decided to take a "leap of faith" to show that it trusts its grassroots and its voters. In particular, he hoped young people, many of whom have been registering as independents instead of Democrats, will "look at what we did today and say, wow, the party is listening to me." Some of the strongest opposition to the change came from black delegates, especially in the older generation, who said it would “disenfranchise” African-American and Latino party leaders and make their convention less diverse. “Are you telling me that I’m going to go to a convention, after my 30 years of blood, sweat, and tears for this party, that you’re going to take away my right to appease a group of people?” said DNC Vice Chair Karen Carter Peterson, a black Louisiana State Senator, presumably referring to white Sanders supporters. Proponents of the change dispute that charge, noting state parties will still include diversity requirements in their delegate selection rules, and that superdelegates can still endorse and advocate for candidates. The changes are the most consequential reforms to the party’s nominating process since the 1980s, when it created superdelegates. Republican have no equivalent to superdelegates in their party. Meanwhile in Chicago, the three finalist cities to host the 2020 Democratic National Convention tried to woo DNC members with food, drink and celebrity guests. Miami’s host committee threw a party on a boat that included free flip flops and beach towels, Houston decked the halls of the Hyatt Regency with advertisements, and Milwaukee brought in basketball legend Kareem Abdul-Jabbar to work a rope line as delegates munched on cheese curds and sipped the wares of the city's famous breweries.